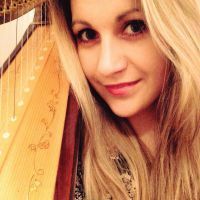 Additional Info: Professional Celtic/Concert Harpist covering events throughout Scotland. Large repertoire of Classical, Traditional, Popular, Jazz and Contemporary Music. Training from Royal Conservatoire of Scotland BEd(Music) and Royal Irish Academy of Music (LLCM). Elegant Background Music for your event, requests also possible to personalise your day.